Inder Loves Folk Art: Golden Gate Singing. Hello, loyal readers! I have much to share with you, but haven't had much time to blog of late. For this past weekend, I have a good excuse at any rate. That's me and Maggie in the center of the hollow square! I lead the song "Fairfield," otherwise known as "29 on the top," referring to its page number in The Sacred Harp hymnal. 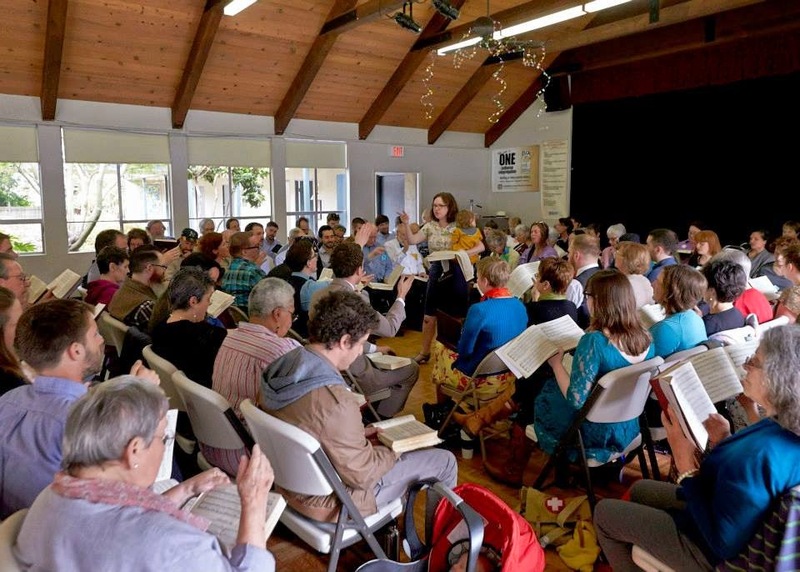 The singing was in Alameda, CA, at the Lutheran Trinity Church which is located on a beautiful, tree-lined street and surrounded by stately Victorian mansions. It was a really nice space for singing. The wood floors and ceiling made for really nice acoustics. The weather was sunny with a cool breeze, and the participants laid out an enormous spread of dishes for lunch. All in all, an idyllic day and wonderful singing. All of these photographs are (c) 2014, Ron Sellers, shared with his permission (thank you Ron!). You guys, it was wonderful. I was basically grinning from ear to ear the whole day. After I arrived, I realized it had been a full year since I had last sung. I don't want to let that happen again! While people often comment on how much sewing and cooking I manage to do despite having two children and a full time job, singing is one area that has taken a back seat since having kids. Before I had children, I rarely missed a weekly singing, and would go out of my way to attend singings out of town. But especially after Maggie, singing fell by the wayside in favor of hobbies (like sewing) which I can do at home with the children. Saturday reminded me: I would really like this part of my life back. 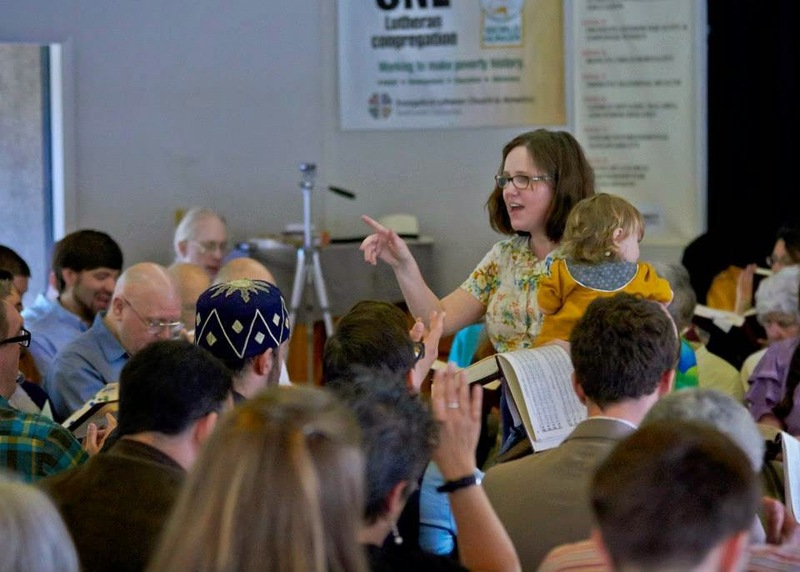 The great thing about my local Sacred Harp community, though, is that even though I've been gone for a year - and barely present at all for the past four years - the community is as warm and the friendships as strong as ever! I had Maggie with me during the morning, and then Steve picked her up after lunch so that I could enjoy the afternoon session without distractions. 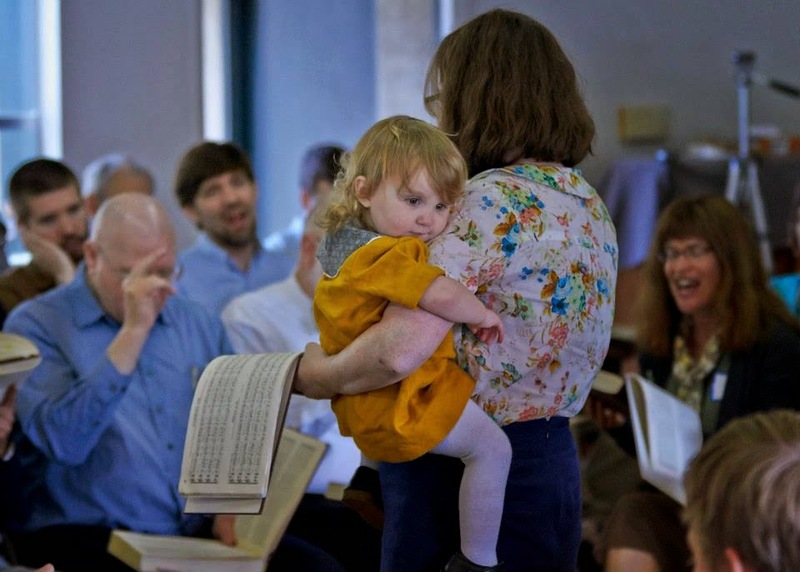 As you can see, she clung to me while I lead a song. She was a little shy, standing in the middle of such a large group of people who were all singing at the top of their lungs, but she wasn't upset. She just snuggled and listened. For my readers who generally come to this blog to read about sewing stuff, you may notice that me and Maggie are both wearing hand-sewns! I am wearing my Colette Violet, which I am happy to report still fits me despite three years and some weight gain! Now that's the sign of a great pattern, right? Making another one of these has been on my list for a while (and I even have some Liberty Tana lawn ear-marked for the project! ), but I think I may want to tinker with the pattern a little - do an FBA and lower the bust dart. Maggie is wearing her Playdate Dress, of course. It's always fun to see handmades in situ, no? Proof that the things I make do get worn! I met a lovely woman from Utah at the singing who commented on Maggie's dress, and then asked me - "Did you make your top? Is that a Colette pattern?" And I was like, "Um, yes! Can you be my next best friend?!" Outside of my little online community, it's rare to meet anyone who sews, let alone someone who follows sewing blogs and knows about indie patterns, let alone sews, follows sewing blogs, and sings Sacred Harp! My mind was blown. Since last posting a finished object, I have made a Plantain t-shirt for myself, a Flashback Skinny tee and knit shorts for Joe, and several gifts. I haven't photographed or blogged these projects because (a) I've been really busy; and (b) they're pretty basic and practical, and not the most interesting items I've ever made. Well, the gifts are pretty awesome but I don't want to post them and ruin the surprise. The t-shirts and shorts had been languishing in piles for a long time, and I finished them mostly to get them out of the way so that I could start some more fun projects that I am really excited to share! . But in the meantime, Joe's fifth birthday is this coming Sunday, and we are having a big party on Saturday! 26 awesome people RSVP'd "yes" to our casual potluck, BBQ, and cake party! Eek! We have some serious straightening up and Spring cleaning to do! And I can't believe my big guy is almost five. One last thing. Best overheard conversation of the past week - Maggie wanted to get on my lap at the same time as Joe, so Joe says to Maggie: "Everyone wants a piece of Mama." WORD. Everyone wants a piece of Mama! I love it! So true around here, too! 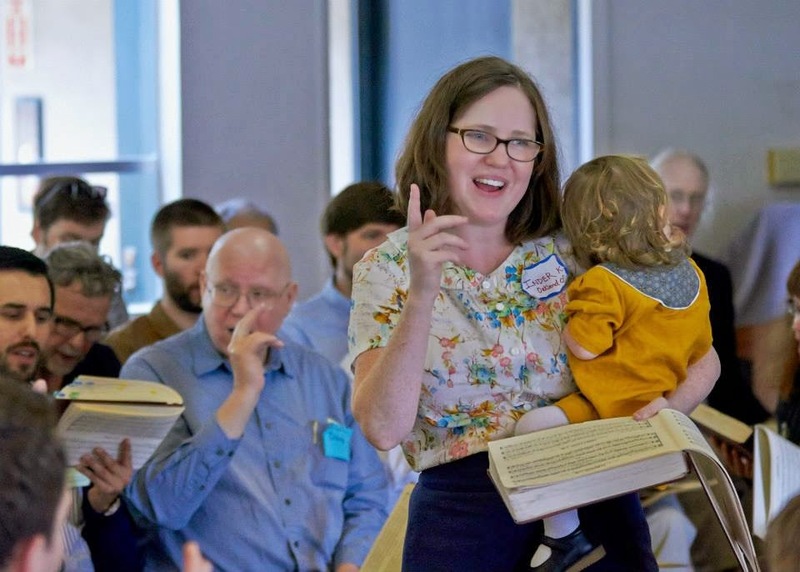 I think it's so great that you do Sacred Harp, even infrequently! And I loved seeing your handmades! You definitely must get together with the sewer-singer-blog reader. Sounds like a match made in heaven! These photos are great Inder - you can see how much you love singing from your face. So glad you got to go, and I hope you can find some 'extra' time for singing more regularly. Love seeing you in your handmades - Maggie's dress is one of my favs. What a wonderful hobby to have, I hope you can make more time for it as it gives you so much joy. You and Maggie both look lovely in your handmades. How awesome that you had a chance to get back to singing! I really can relate - people often make comments to me, too, about how I find the time to sew and cook (that irritates me actually because I always feel like it's a "you have too much time on your hands" kind of a question, but I digress). Anyway, I haven't sung in forever either and I miss it. The me-mades look great. You look beautiful and happy in those photos and one can tell you really love singing. Maggie clinging to you looks adorable too and reminds me of my little girl. Thank you for sharing. Thank you!! Maggie was so sweet and was the star of the singing. That girl can work a room! It's true, you look luminous. Glad you got a chance to reconnect with this part of your heart. How wonderful, you look so happy. I hope you get to sing more often. Thanks Nicole! It was so wonderful! I will try to make it happen. Wow! That is so neat. Looks like you had a wonderful time, Inder. :) Glad that you were able to participate. I hope Joe has a happy birthday! Thank you Cindy! Joe had an absolute blast. It was a lot of work for us, but he was just on cloud nine! Isn't it a buzz to meet another sewing fanatic - on the odd occasion it's happened to me it's made my day. One day someone recognised me in a fabric store by a bag I'd made and blogged, which was funny and kind of surreal. It was such a great day! I can't believe you ran into a blog fan! That is too awesome! That has never happened to me. Of course, the fact that half my readership seems to live in Australia probably doesn't help. ;-) I need to come visit y'all!